Figure 15.6. Comparison of 24-hour urinary monoclonal protein concentrations and sFLCs in 2 patients with LCMM, measured at different times after chemotherapy. (Courtesy of R.A. Kyle and J.A. Katzmann). Figure 15.7. Correlation between changes in serum and urine FLCs during disease evolution in 71 patients with LCMM. Initial measurement values were changed to zero and transformed logarithmically for comparison purposes (p=0.0001). (Courtesy of R.A. Kyle and J.A. Katzmann). Figure 15.8. Comparison of sFLCs and urine electrophoresis for monitoring response to therapy in 25 patients with LCMM. Figure 15.9. Two LCMM case studies in whom sFLC remained abnormal, indicating residual disease while urine tests normalised during follow-up. (A) κ LCMM: dFLC indicated no response to therapy, whilst UPE and uIFE became negative at cycle 2, but monoclonal bands re-appeared post-ASCT, indicating disease progression. 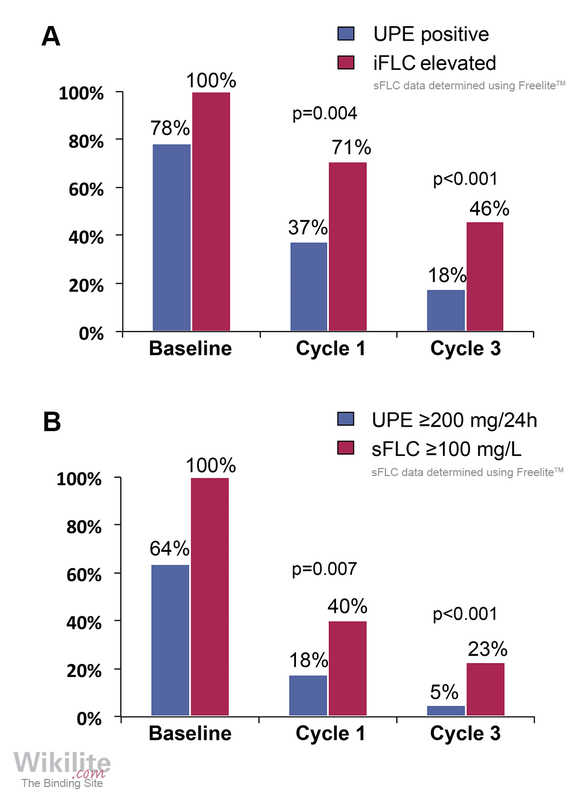 (B) λ LCMM: dFLC indicated VGPR at the end of cycle 2, whereas UPE and uIFE became negative. 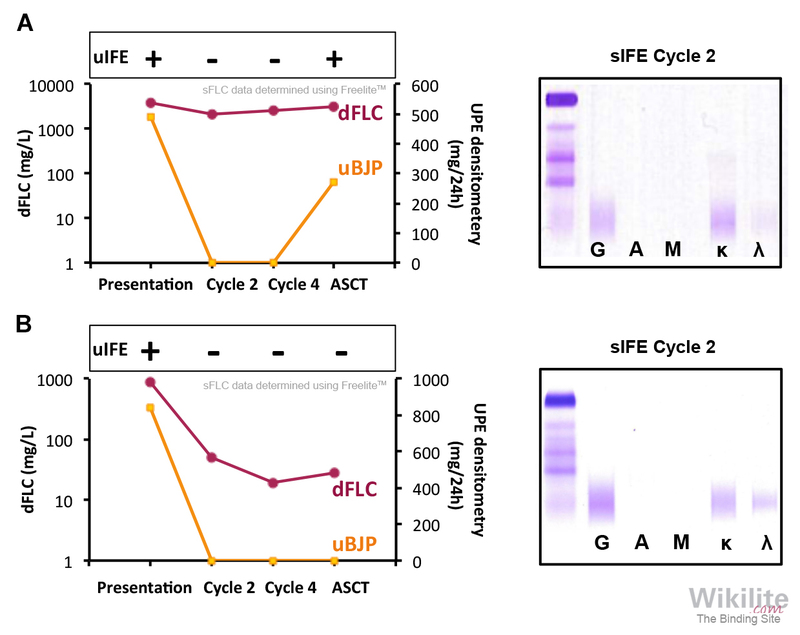 Green lines: dFLC; red lines: UPE; inserted gels: sIFE results at the end of cycle 2. (Courtsey of T. Dejoie). Assays that are useful at disease diagnosis are typically useful for disease monitoring. This is particularly true for sFLC immunoassays. Not only are they quantitative but their analytical sensitivity is considerably better than measurements of monoclonal bands on electrophoretic gels (Chapters 4 and 24). 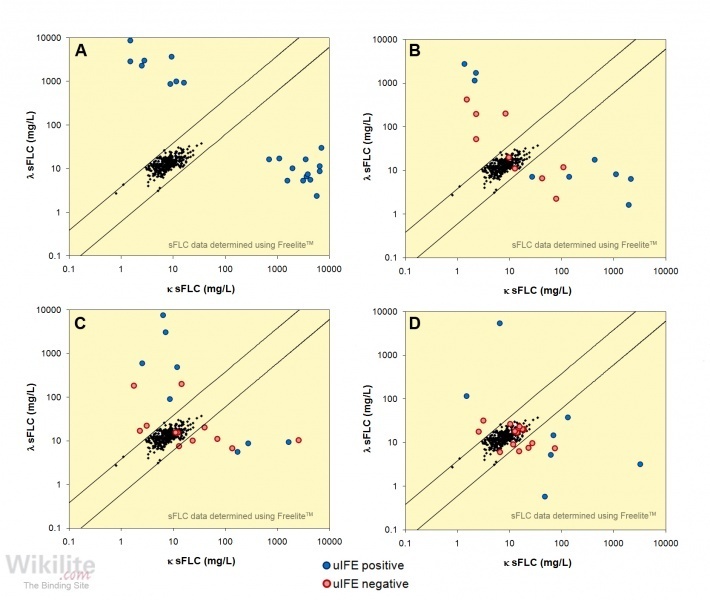 During the follow-up of LCMM patients who have detectable urinary monoclonal FLCs, changes in serum and urine FLC concentrations may show a good correlation. This is illustrated by two LCMM patients from the Mayo Clinic (Figure 15.6) . In both patients the concentrations of FLCs in serum and urine fell following chemotherapy (although in the first patient this was not in parallel, possibly due to inadequate 24-hour urine collections). 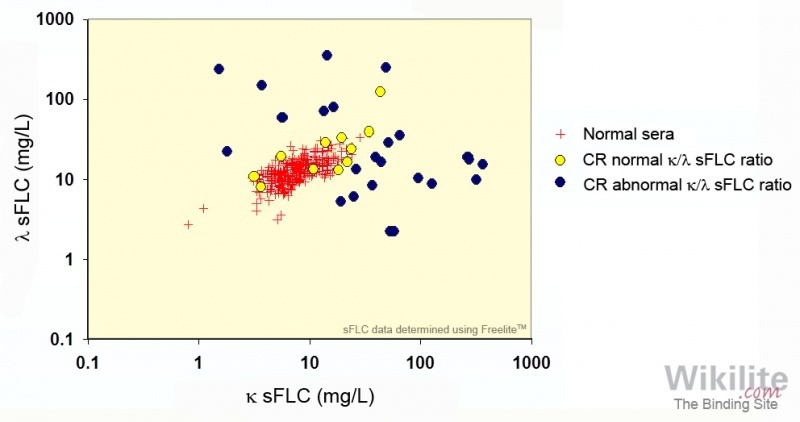 In a further 71 LCMM patients, a good correlation was found between changes in serum and urine FLC concentrations (Figure 15.7). The authors concluded that sFLC measurements provided a satisfactory alternative to 24-hour urine collections for monitoring patients with LCMM. However, there are considerable differences between serum and urine FLC measurements when assessing rates of remission. In The Lancet study , 32% (26/82) of patients were considered to be in complete remission when assessed by urine FLC concentrations compared with only 11% (9/82) upon sFLC assessment. In the same clinical trials, 10% (117/1189) of patients with intact immunoglobulin multiple myeloma (IIMM) had complete serological remission. Since the serum responses to chemotherapy were similar in IIMM and LCMM, the results indicated that urine FLC measurements were relatively insensitive for assessing residual disease. This has been substantiated in many other studies (Chapter 24)  and is illustrated in Figure 15.8. 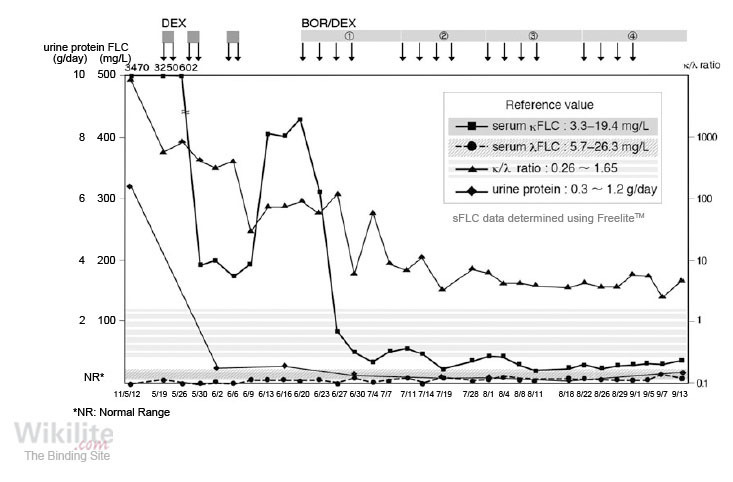 In many LCMM patients, their urinary monoclonal protein becomes undetectable while serum tests remain abnormal; two case studies are shown in Figure 15.9 . Reid et al. assessed serological response in 35 LCMM patients judged to have achieved a complete response (CR) by negative serum and urine IFE. In 11 patients, the κ/λ sFLC ratio was normal, consistent with the definition of a stringent CR. In 24 patients however, an abnormal sFLC ratio suggested the presence of residual disease (Figure 15.10). Other studies have similarly demonstrated that abnormal sFLC κ/λ ratios indicate residual disease in patients with negative serum and urine IFE . Dejoie et al. compared the performance of serum and urine measurements for monitoring 111 LCMM patients enrolled onto the IFM-2009 trial. At diagnosis, the proportion of patients with measurable disease was 100% by iFLC compared to 64% by UPE. After 1 and 3 cycles of treatment, the proportion of patients with measurable disease fell for both assays, but sFLC analysis remained the more sensitive test at each time point (Figure 15.4B). Similar findings were reported at the end of consolidation.The most likely explanation for these results is that urine assays under-estimated the amount of FLC production (and over-estimated the response to treatment) due to the renal metabolism of FLCs (Section 3.5.2). For 14 IFM-2009 patients at the end of induction, uBJP concentrations fell below measurable concentrations, whilst sFLC remained at measurable levels. Consistent with this, Caillon et al. reported that the presence of an abnormal sFLC ratio at the end of consolidation showed good agreement with the presence of minimal residual disease by flow cytometry. Although the current IMWG guidelines only recommend sFLC measurements for LCMM patients when urine monoclonal protein concentrations are unmeasurable (Section 25.3.5), British guidelines  state that there is a “clear rationale” for using sFLC assays “to assess response in light chain only disease, irrespective of the extent of light chain excretion in the urine” (Section 25.6). Therefore, it seems likely that serum FLC measurements will be increasingly used to routinely monitor LCMM patients throughout their disease course. Sensitivity of sFLCs for identifying poor response to treatment . A 59-year-old female, previously diagnosed with asymptomatic κ LCMM, was admitted to hospital because of increasing proteinuria. 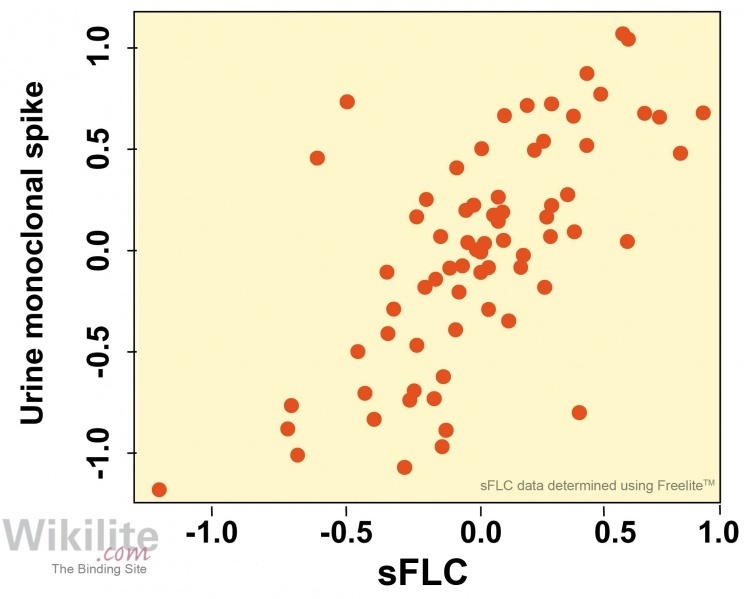 Haematological work-up reported a κ sFLC concentration of 200 mg/L and a λ sFLC concentration of 6.73 mg/L with a corresponding κ/λ sFLC ratio of 29.72. Urinary protein was reported as 6.5 g/24 hours and immunotyped as κ BJP. A bone marrow biopsy was hypocellular with 48.0% plasma cells. The patient was diagnosed with symptomatic κ LCMM (stage IIA [Durie and Salmon]; stage 2 [International Staging System]). The patient received induction therapy with high-dose dexamethasone (HDD), followed by four cycles of bortezomib/dexamethasone (BD). Over the course of treatment, urinary protein decreased from 6.5 to 0.1 g/24 hours (Figure 15.11). Retrospective measurement of sFLCs twice weekly revealed additional information on FLC kinetics: sFLC levels initially fell during induction then markedly increased prior to starting BD therapy. Smaller changes in sFLC concentrations were also observed during each BD cycle, and the κ/λ sFLC ratio never entered the normal range. This case study and others  highlight that measurement of sFLCs allows early identification of patients responding poorly to treatment, whereas urine testing was uninformative. In future, such information could be adopted to allow early cessation of ineffective therapy and a switch to a more appropriate chemotherapeutic strategy.